Our current Residents’ Forum Constitution was agreed in 2011 and amended slightly in September 2014. We are recognised as a legitimate neighbourhood forum by Birmingham City Council. 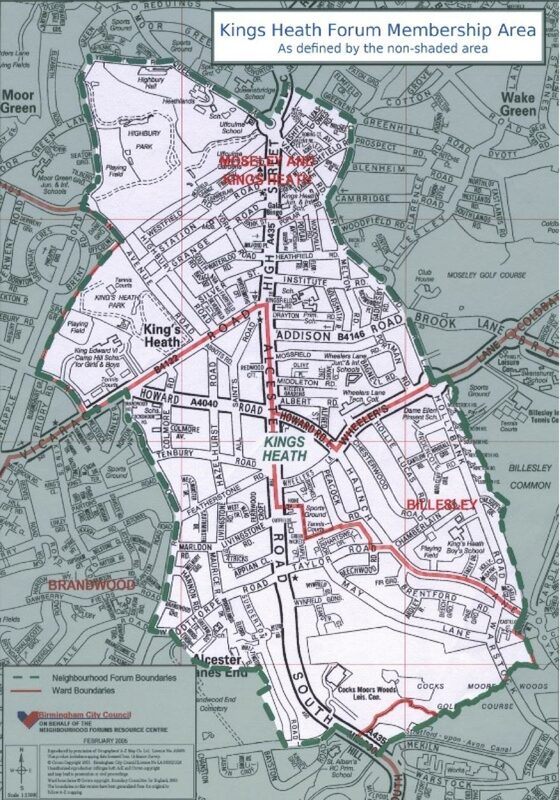 The area we serve was agreed after a public consultation in 2011. A neighbourhood forum for Kings Heath has existed since the early 1990s and has served roughly the same area since then. Day to day the Forum is run by a Management Committee, which usually meets each month. All meetings are open to members of the public to attend. We also organise public meetings on issues of particular public interest and there are task groups to pursue specific matters (e.g. road safety). Management Committee members are appointed at Annual General Meetings (AGMs) or seconded between AGMs by the Management Committee.